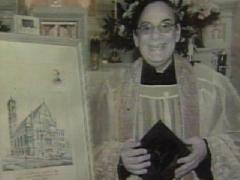 BALTIMORE - The order that runs St. Leo's Catholic Church in Baltimore's Little Italy neighborhood has informed parishioners that an investigation has concluded former pastor Michael Salerno molested a boy in the 1970s while at a church in New York. Known to many as "Father Mike," Salerno was a brother at All Saints Church in Brooklyn, N.Y., when the alleged abuse occurred. The head of the Pallottine Fathers, the Rev. Peter Sticco, wrote in a letter Sunday that a final report by the Diocese of Brooklyn confirmed the abuse of the 13-year-old boy. It is not clear if Salerno will be criminally charged. He was removed as pastor at St. Leo's when the allegations surfaced more than a year ago. He had been there more than 10 years. "This is something that happened 40 years ago," one man told 11 News reporter John Sherman. "And I'm sure that this man has spent a great deal of prayer and remorse about what had happened before he was even ordained as a priest." The church's congregation grew from about 100 to about 800 since Salerno's 1997 arrival. The Vatican will decide if he will be defrocked.